It's been a while since I did a still life. But last night I had art class, and no real idea of what I wanted to paint. None of the reference photos I had with me really "grabbed" me. 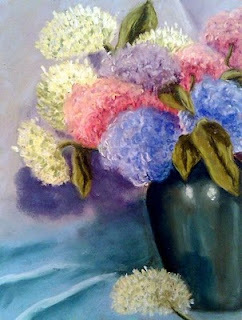 But Christina had the most glorious arrangement of hydrangeas set up in one corner of the studio. I loved them because they had so many colors! White, lavender, pink, blue. So I decided they would be my project for the evening. I have been getting lazy about working from life as I've been too enthralled with my landscapes (which I still love), so this was good practice for me.